The Archive contains music for social dance by a range of eighteenth- and nineteenth-century composers. Johann Strauss the elder (1804–1849) is particularly well-represented, with two bound collections of his waltzes arranged for keyboard. Strauss also published medleys of popular tunes known as pot-pourris. 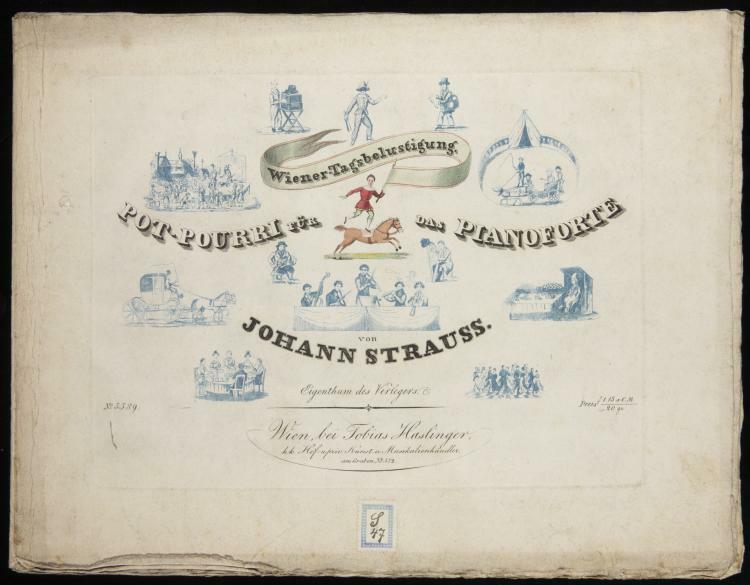 His Wiener-Tagsbelustigung presents melodies from several of his works of 1828–1829 (Hirten-Galop, Champagner Waltz, Hietzinger-Reunion Waltz, Wilhelm Tell-Galop, and Lager-Walzer), arranged in a medley for solo piano. Publisher Tobias Haslinger issued Strauss’s music in formats designed to increase sales to amateur musicians. Here the title page is printed in two colors, to which additional watercoloring has been supplied by hand.